Our smallest size Air Kicks (model #11206 with T0 Springs) fit kids with a body weight between 55 and 99 lbs. (aged 8 years and up). The new, improved wider boot design of these latest AIR KICKS® models are more ergonomically shaped, making them an easy fit for almost everyone. The new design retains the patented JUMPING JAX® technology, which utilizes heavy-duty, rubber T-Springs to capture and then transform downward energy into longer, low-impact strides that are gentle on the ankles, knees and back. Another improvement to the new AIR KICKS model is an extended range of replacement T-Springs, which can be interchanged to adjust for varying body weights. This means if a user's weight goes up (for instance, when a child gets a little bit older), as long as the boots still fit, you can purchase replacement T-Springs in the next size up, then continue using your Air Kicks! 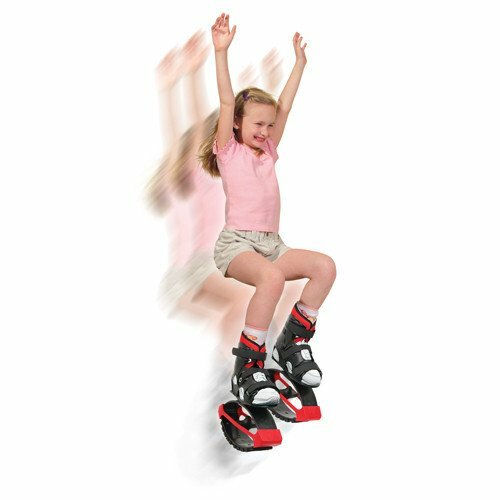 Not only do AIR KICKS Anti-Gravity Boots deliver a soft cushiony motion thats gentle on joints and bones, they also provide a sensational calorie-burning, coordination-building, leg-strengthening workout. They feature high-traction non-marking treads that are safe to use on virtually any surface, indoors or out, and wont mar floors! Popular for years, now weve made a great product even better with the release of the latest AIR KICKS design. Brand: American Pogo Stick Co. If you have any questions about this product by American Pogo Stick Co., contact us by completing and submitting the form below. If you are looking for a specif part number, please include it with your message.